AXIS Q6000-E features four 2-megapixel sensors, providing a complete 360° field of view over large areas. Integrated with an AXIS Q60-E series camera, which is easily mounted inside the AXIS Q6000-E, the solution offers full overview and the possibility to optically zoom in on any object of interest. 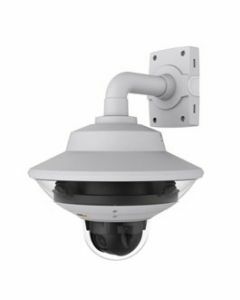 This makes the situational awareness camera solution ideal for city surveillance applications such as monitoring of public squares and parking lots and other open areas. Any AXIS Q60-E is quickly and easily mounted inside the AXIS Q6000-E. There is no need for any mounting brackets or extra equipment as AXIS Q6000-E uses the same brackets and network cable as the AXIS Q60-E. Furthermore, Power over Ethernet is supplied to both cameras through AXIS Q6000-E to ensure an easy installation. AXIS Q6000-E, integrated with any AXIS Q60-E, offers a unique advantage to easily enhance existing AXIS Q60-E installations, by adding the possibility to maintain an overview of the entire monitored area, while capturing every detail.